The shell pictured here is a victim of ocean acidification. 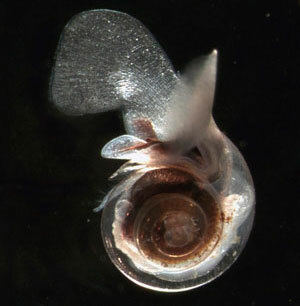 The normally-protective shell is so thin and fragile, it is transparent. Increased carbon dioxide in the atmosphere is one of the recognized causes of our changing climate. These increased levels of carbon dioxide are also problematic for the ocean and marine life. Approximately one-third of the excess carbon dioxide in the atmosphere is absorbed by the ocean. As this carbon dioxide dissolves in the ocean, it causes the pH of water to drop, meaning the water becomes more acidic. Ocean acidification is problematic for marine life such as shellfish and corals that produce limestone (or calcium carbonate) shells or skeletons. Increased acidity means less carbonate is available to form these shells and skeletons. The effect is similar to osteoporosis, slowing growth and making shells and skeletons weaker.